The Gray family proudly poses among their growing trees. 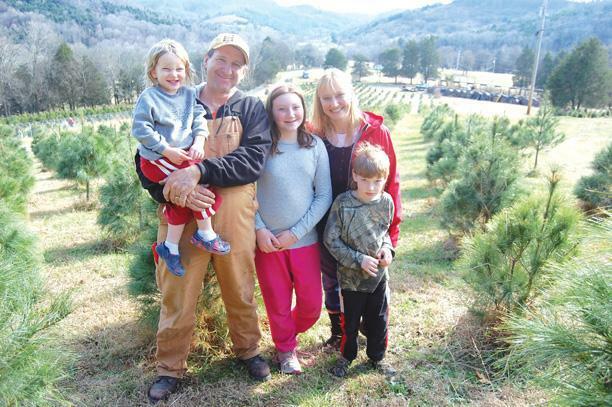 Now open for its second year, David and Dawn Gray's Wildwood Christmas Tree Farm attracts tourists by the droves into the sylvan hills of Cannon County while creating holiday memories for families near and wide. Located seven miles north of Woodbury off Auburntown Road, the five-acre tree farm flourishes with 5,000 saplings. Its white pine, Norway Spruce and Canadian hemlock prove tall enough for harvesting this year, while the Turkish fir, Canaan fir, Meyer Spruce and blue spruce will take another year or two of growth before they're ready for harvest. "We're hoping to develop a family experience that is more than just picking up a Christmas tree," said David. "You can pick up a tree at Wal-Mart, but we want this to be something that will draw families back year after year. We're focused on the kids with a craft room and tree house. We ask people what else they would like to see here. The idea is to tailor our place to the customer and add something new every year." On Thanksgiving weekend, the Christmas tree farm's busiest two days, coming for the first time to hunt for a tree were Woodbury's Jared and Danya Odom and their three youngsters Karsten, Malachi and Mya. The family spent a good half hour searching for just the right tree. Father Jared spied a nice one and steered the family toward it before saying, "I think this one is tagged, you guys." He spies a white note atop tree and says, "Sold! Darn!" Mom Danya tells her boys, "Choose one that's really cool." Jared spots another handsome tree and says, "This one's pretty nice. Should we get it?" "I think this one up here's a contender," says Danya. "But let's go look in that other field." As they walk toward another tree lot, Jared explains, "The kids wanted to cut their own tree and since we've got plenty of cedar, we thought we'd try something different." In the second lot, the family settles on a splendid white pine, and the boys take turns with a small handsaw cutting at the base of the tree. Dad polishes off the job, and all stand watching with joy as the tree topples to the ground. Says Danya of their selection, "It looked full and healthy, and the boys wanted to play hide-and-go-seek, so we had to pick one." The Odom's tote their special tree back to the gift shop, enjoy sipping hot chocolate and watch attentively as farm hands stand the pine in a tree shaker, where it does a 10-second jig and shakes off any loose needles or dead grass from its limbs. Next it is pulled through a tree bailer which swaths the tree in netting to protect it from wind damage on the ride home. David, who grew up in Carlsbad, N.M., says the seven-to-eight-foot trees prove to be the most popular. And for those who choose not to walk the farm and slice out their own tree, they may pluck a pre-cut Fraser Fir. Even the pre-cut trees remain astonishingly fresh. Boasts Dawn, "The Frasier Firs we bring in from Northeast Tennessee. On Valentine's Day last year our fir was still just as fresh. Part of the reason they stay fresh so long is because they were cut the week before Thanksgiving, and we put them in water within 24 hours." What spurred the Grays to launch a Christmas tree farm? "We were trying to decide what to do with our 70 acres other than just bush hog it and mowing the grass. I have an obsession with trees. I love trees," confesses David. "We thought of planting hardwoods, but you have to wait 30 years to harvest. Then we started thinking about Christmas trees and did research. It's a good five- or six-year investment before you see any return. We started planting back in 2008, and here we are." Besides beautiful trees, the Gray's holiday attraction boasts a handsome two-story gift shop and a hillside playhouse area guaranteed to bring the child out of anyone. "People already know we have Christmas trees," said Dawn, who grew up in Russellville, Ark., but we have a huge playhouse area with two small zip-lines at varying heights for kids and an adult zip-line. We also have swings, slides, rope bridges, cargo nets, catwalks, a bucking horse barrel and monkey bars." Taking advantage on this sunny day were Jennifer and Earl Burns of Columbia, Tenn., as they watched their children Chloe and Josiah enjoying the zip-line and other exercising attractions. "I was checking the web for different Christmas tree farms, and they had other interesting things besides cutting down the tree," said Jennifer of their reason for driving to Cannon County. "They have lots of things for kids and more varieties of trees." David designed and built the playhouse area as well as constructed the 3,000-square-foot office and gift shop using lumber from oak, poplar, cherry, walnut and ash, many of them logged from the surrounding acreage. Stocked with the handiwork of local artists and craftsmen, the shop offers gift items ranging from wooden bowls and spoons and picture frames to handmade soaps, jewelry, stockings, scarves, afghans and Christmas ornaments. 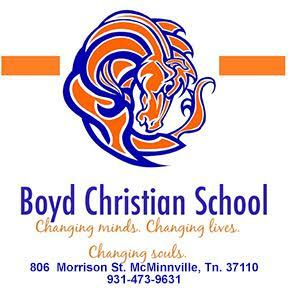 Prices vary from $3 to $150. Crafts folk represented in the shop include wooden bowls by Bob Stancil, wooden jewelry boxes, salad tongs, cutting boards, peppermills and pizza cutters by Doug Pelren, plaques and wood games by Roy Haney and crochet work by Rhoda Anderson. As for the breakdown of chores here, Dawn handles the business end of things, coordinates with the craftsmen and updates the web site, while David is caretaker of the trees. The busy Thanksgiving weekend they had extra hands in the form of David's parents Orval and Esther Gray, Dawn's parents Don and Judy Minchew from Knoxville, and Dawn's sister and brother-in-law Lora-Joy and Andy Adzima and their two sons, plus, David and Dawn's children, Hannah and Caleb. David works labors full time as a carpenter for Preston Construction in Woodbury, and during his spare time will take down troublesome trees from the yards of home owners who want them removed. But right now, business centers on helping customers find the right tree for their living rooms this December, and thus far, says David, the harvest has gone as they expected. "When we opened last year, we hoped to sell 100 trees and sold 98. We're hoping to double that this year and are halfway there. And we hope to double that again next year," he said. As for what he enjoys most about turning his hillside and fields into a green holiday wonderland, David says, "I like it when the kids cry because they have to leave. That's good. The kids have an incredible time. They love the hayride, the tree house. "We had a family stay out here about six hours today. I want people to come out of the house, enjoy the country, sit in the rocking chair and make a day of it. I like it when they stay a long time."